Renee and I were in Urgent Care for five hours on Sunday. Somebody had again changed the order. You don't need a chemo nurse to hook up the anti-fungal medication. This happened last Saturday as well! And then last Sunday the order had been cancelled altogether! This is one of the best hospitals in the world, but there is something weird going on in Urgent Care that needs to be fixed. While I was sitting there, I was reflecting on the fact that only one week had gone by since we came back from Florida. That seemed like ages and ages and ages ago. I had gone to the first service at Trinity, so I could go with Renee to the hospital later. I was sitting on a little side bench in the back, in case the tears would start to flow again, as is usually the case nowadays. The song, "Lord Reign in Me" started the tears and then the next one, a contemporary version of "Amazing Grace" really got me going. Ray and I had been singing that together in Florida. Good thing nobody could hear us! The evening service at Redeemer starts at six. I was only a few minutes late. Renee was too tuckered out to sit through a service and Ray couldn't be there either, he is in Manitoba, so I bought the CD. This was part 4 in the series on Job. One of the assistant pastors in his opening remarks said something like this: To worship God authentically, we must embrace the messiness and brokenness of being human and the mysteriousness of God, and trust in His love. Tuesday, January 29, 2008. Renee left for the hospital already. I wanted to first write this blog. It has been swirling around in my head long enough. When I'm done I will lug the computer to the hospital in my backpack, so we can watch movies, sharing one set of headphones. "Lord, how do you want to use me today?" I am so glad that God can use you and me in spite of our short comings. My motto now is, "Giving Away a Bible a Day Will Keep the Doctor Away!" Maybe there will not be an oppurtunity every day, but I want to be open to the leading of the Lord. Sunday there was an elderly gentleman all alone in the same area in Urgent Care as Renee. His wife had passed away in May and he has one daughter in Florida. After talking to him, I asked if he would be interested in something to read. He was extremely happy to get a Living LifeLight N.T. 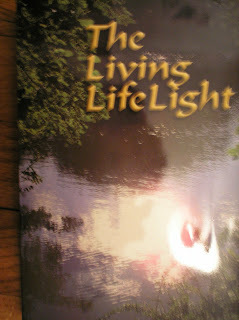 On the cover is a picture I took in Central Park in the summer of 2005. I didn't like it at first, but now I am glad that we decided to use it. May God bless the reading of His Word.